The following video shows several interviews with actual cops in actual police stations in New York and New Jersey being asked what a citizen should do in the time it takes between notifying the police of an armed robbery or intruder inside their home or business and when the police arrive. The advice is stupefying…Yell at them, sometimes that scares them off. Get a dog. Use a bat. Hold your cellphone up to your ear to scare them so they see you’re calling someone, and so on. The only thing more frightening than this advice from the police themselves, was the reaction by the mainstream media and politicians that vilified Milwaukee County Sheriff David Clarke Jr who released a Public Service Announcement advising citizens to arm themselves because the police can’t always be there in time. When I say that Obama’s Government wants you disarmed, I mean Obama’s Government wants you disarmed. There are 270 million registered guns in America, and that doesn’t include the guns people hand down across generations within their families that are likely unregistered and the ones people bury in their backyards to keep the Government’s hands off. 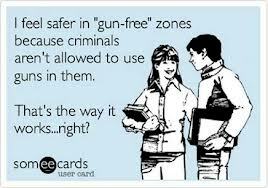 The way the media and most liberals treat gun owners, gun ownership and guns, you would think that a substantial volume of those 270 million guns were being used by regular law-abiding citizens, your neighbors, friends and family, on a regular basis, to commit crimes, murder and mayhem by pounding them off at kids as they trespass on the way to the beach, shooting them into the air on July 4th, triple tapping through their window at aggressive drivers, and yet incidents of gun related deaths, whether via registered guns or not, is exceptionally rare. Of course the way the media covers these lunar eclipse events of gun violence is enough to bludgeon your mind with a blunt cudgel until it bleeds out your ear, and yet in 2011 there were only 8,583 gun-related deaths in America, just 0.34% of all deaths, all year. That number is insignificant, yet politicians submit new legislation hourly to ban this non-threat. When alcohol was illegal, the number of people drinking alcohol increased. When marijuana became illegal, its use increased and today, anyone anywhere is no more than a phone call or two away from someone who has it, or can get some. But it’s illegal, right? If guns are made illegal, only the criminals will have easy access to them and millions of Americans who would choose not to be victims will hide them illegally, which is why all guns must be registered, so the Government can come knocking on your door one day and tell you to hand them over. Overnight, millions of Americans will become instant felons for refusing to submit to Government authority by surrendering all of their firearms. They will live in fear, petrified to ever use them in anxious trepidation of the swift and furious punishment that the iron fist of Government would bring down upon them, even if they had to use their ill-hidden gun to save their family from being murdered, or their wife or daughters from being raped. Make no mistake, the Government is coming for your guns, and your right to protect yourself with guns. So when that time comes and you are faced with an armed assault on yourself, your wife, your sons, or your daughters, I hope for your sake that you can yell really, really, really loud. For more information, or to get engaged in this campaign, visit James O’Keefe’s Project Veritas. ‹ How to Destroy America in Ten Easy Steps – Recognize Any?